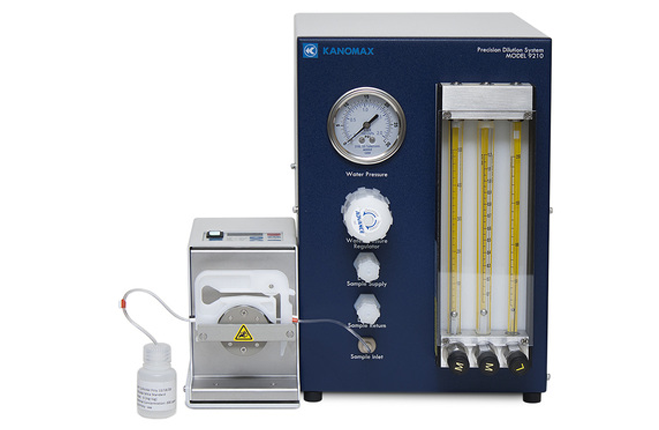 The Precision Dilution System (PDS) offered by Kanomax FMT is an innovative tool that allows you to simply and accurately dilute both Polystyrene Latex Spheres (PSL) and colloidal silica suspensions as low as 2000 particles per mL. A high concentration and subsequent dilution ensures that the Kanomax FMT standards are much less susceptible to contamination from the walls of the bottle used to ship the standards. You can also use the PDS to dilute any high-purity, aqueous fine-particle suspension or a limited range of clean solvents. The final size for all PSL and colloidal silica standards is determined by the Liquid Nanoparticle Sizing system (LNS). Both the PSL and colloidal silica standards are supplied at an accurate concentration starting at 4E7 particles per mL. Kanomax FMT also supplies colloidal silica standards at 10, 20 and 30 nm for calibrating the ScanningTPC, and an LNS Volume Standard for calibrating the inspection volume of the NanoParticle Nebulizer (NPN). A complete list of all NanoParticle Standards currently offered by Kanomax FMT with shelf life and storage conditions.